After Anthony E Larson‘s death I finished Red Carpets partly to thank him for all the hard work he has done in bringing to light much to the Polar Configuration, how it relates to Restoration and how Joseph Smith taught it. But when it was shared in The Restored Gospel, Ancient Planetary History and Cutting Edge Science Facebook Group along with my resource page for Polar Configuration not many nice things was said about me. Only one person had the integrity and courage to stand up for me and to say something nice about me, my friend Matt McCurdy. The sad thing the admins of the group deleted all the nice things that Matt McCurdy said and only left the negative things others said. What are they so affraid of, the Holy Ghost/Holy Spirit can testify of any and all truth to anyone who asks with a “sincere heart, with real intent, having faith in Christ” Moroni (LDS/OPV 10:4) (RLDS/RAV 10:4-5). Below is one of the things Matt said in my defence, which subsequently has been deleted by one of the admins of the group, as lately they only allow for negative statements about me to stay. Matt also shared this excellent quote from Hugh B Brown in my defense. I admire men and women who have developed the questing spirit, who are unafraid of new ideas as stepping stones to progress. We should, of course, respect the opinions of others, but we should also be unafraid to dissent — if we are informed. Thoughts and expressions compete in the marketplace of thought, and in that competition truth emerges triumphant. Only error fears freedom of expression. We must preserve freedom of the mind in the church and resist all efforts to suppress it. Perhaps Mark Pinnell forgot how Joseph Smith studied Hebrew later in his life, after he translated the Book of Mormon by the “gift of God” see the Title Page from the Gold Plates, and even after receiving many revelations from the God of Abraham, Isaac and Jacob. Apparently I’m not the only Mormon who believes in the wisdom of understanding the Hebrew/Jewish way of thinking as Bradley J Kramer wrote Beholding the Tree of Life: A Rabbinic Approach to the Book of Mormon. His LDS Mag author profile mentions that book. His article Jewish Insight to Improve a Mormon’s Sabbath on LDS Mag is talking about how Hebrew/Jewish insights can help us out in our understanding of the Sabbath. Covered in the dust of your Rabbi is a fantastic video that is helping people understand the culture of the Jews while Jesus Christ was alive to help people understand the scriptures. The prophets in the Book of Mormon encourage us to learn the language of the fathers, which by the way is Hebrew. Mosiah (LDS/OPV 1:2) (RLDS/RAV 1:2-3) is one of many examples were the prophets in the Book of Mormon talk about the importance of the Hebrew language. Mosiah (LDS/OPV 1:2) (RLDS/RAV 1:2-3) And it came to pass that he had three sons; and he called their names Mosiah, and Helorum, and Helaman. And he caused that they should be TAUGHT in ALL the LANGUAGE of his FATHERS, that thereby they might BECOME MEN OF UNDERSTANDING; and that they MIGHT KNOW CONCERNING THE PROPHECIES which had been spoken by the mouths of their fathers, which were delivered them by the hand of the Lord. I have found studying Hebrew idioms has helped me understand the Hebrew scriptures more that I had before. Please read Understanding the Difficult Words of Jesus there are many Hebrew/Jewish things that this book has opened up to my eyes. You can watch the video Understanding the Difficult Words of Yeshua or the video series The Quest first to see if it is worth your money to buy the book. Personally I have found it well worth my time and money. Anthony knew full well my position on the LDS / Brighamite church while I has hosting the lectures for him. He has said that anyone from any church including any of the other many restoration churches or groups could be members of the Facebook group. But apparently the only church allowed to have anything spoken good of it was the LDS / Brighamite church. 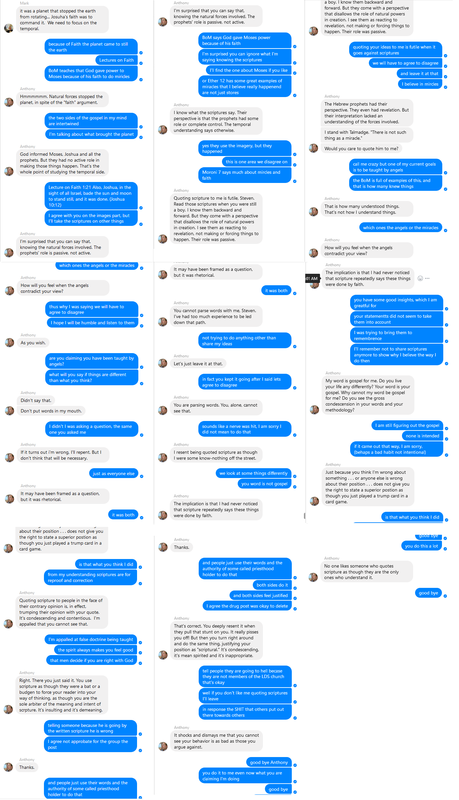 Many people in Anthony’s Facebook group were put down by members of the LDS / Brighamite church and I stood up for them using scriptures from the Book of Mormon. But sadly I have found people love the idea of the Book of Mormon more than what the Book of Mormon actually says. I put together Except this and Except that, which is a few quotes from Joseph Smith and summaries of what hundreds of people have said to me in response to many Book of Mormon verses I have quote in LDS Facebook groups. Although “THE IDEAL TEMPLE” was an IMPORTANT early symbolism document, MCCREAS’S early efforts were NOT generally AVAILABLE or USED. Later temple architect Keith Stepan CAME UPON the RESEARCH and VALUED IT. He eventually began IMPLEMENTING SOME of its CONTENTS, along with his own ideas in designs for the Bountiful Utah and Mount Timpanogos Utah Temples. As later Managing Director of Temple Construction at the turn of the century, STEPAN then COMPILED the Church’s first OFFICIAL SYMBOLISM MANUAL under the approval of Pres. Gordon B. Hinckley. IT provided official Church parameters for ALL TEMPLE SYMBOLISM for a time, … This manual is no longer in use. As you can see in this quote it was not LDS / Brighamite leaders who put taught or directed to put the symbolism in the temples it was the architects who did this from studying the scriptures, and I suspect reading Anthony E Larson works, after others had tried before and were not allowed to. The profits in Hollywood use the Polar Configuration in many of their movies, of which I have posts planned where I am going to point out some. On the other hand I have not heard the “prophets” in the LDS / Brighamite church use any of Polar Configuration imagery in any of their talks. Instead LDS / Brighamite leaders will talk about their trips to Disneyland at General Conference. Look to God and Live by Thomas S Monson is one of many examples of this. Once I asked Mark Pinnell directly in the Facebook group for one example of the LDS / Brighamite leaders using the Polar Configuration imagery in any of their talks, he was not able to give one. Would this imply that Hollywood is full of “prophets” since you can see the imagery in Hollywood more than from LDS / Brighamite leaders? After all people in the group claim that because the imagery is on the LDS Conference roof they must have “prophets” running their church. I just ask were are the fruits of the titles they claim? After all Jesus said you shall know them by their fruits not know their fruits after you believe in them a man aka the arm of flesh. Anthony was not the most open on what he believed on a number of subjects. I completely understand why, as so many LDS / Brighamite only believe what their leaders say instead of taking the Holy Ghost/Holy Spirit as their guide, see 2 Nephi (LDS/OPV 32:5) (RLDS/RAV 14:6). 2 Nephi (LDS/OPV 32:5) (RLDS/RAV 14:6) For behold, again I say unto you that if ye will enter in by the way, and receive the HOLY GHOST, IT will show unto you ALL THINGS what ye should do. Perhaps Anthony shared some things with me because he knew I wouldn’t discredit him for simply having different ideas. It is common for LDS / Brighamite members to ask me if I am a member of their church if I bring up something they were not aware of from the scriptures, instead of trying to understand the scriptures. In the email exchange below, I shared a draft of King Brigham with Anthony. Below is the link from the email that Anthony states he “enjoyed and I concur somewhat” with the content that was in it. We never talked about the details of what he meant by “I concur somewhat”, so to what extent he agreed with it is anyones guess, but it does seem he agreed to the basic tenet of it as he stated “I concur somewhat”. In the first sentence of the post you will notice how I state I did nothing with the draft for about a year. I sent the email on Wed 06 Jul 2016 and Anthony replied on the same day Wed 06 Jul 2016. From the url for the post you can see I published it on 2017-07-4, just shy of one year from the email. Here is the first sentence from the post. I have been sitting on this post for around a year. Sadly some of you will now no longer want to look at Anthony research anymore because of this. I plead with you to reconsider. Although I don’t agree with Anthony on many things we both believe in the importance of the Polar Configuration even if we don’t agree on every point regarding it. If my word doesn’t mean much to you, look what Joseph Smith said about accepting truth. I caution you to not take a supposed authority as truth instead of truth for authority. Mormonism is truth; and every man who embraces it feels himself at liberty to embrace every truth: consequently the shackles of superstition, bigotry, ignorance, and priestcraft, fall at once from his neck; and his eyes are opened to see the truth, and truth greatly prevails over priestcraft….The first and fundamental principle of our holy religion is, that we believe that we have a right to embrace all, and every item of truth, without limitation or without being circumscribed or prohibited by the creeds or superstitious notions of men, or by the dominations of one another, when that truth is clearly demonstrated to our minds, and we have the highest degree of evidence of the same. According to Joseph Smith if we are not accepting truth were ever it may come from we are not “true Mormons”. The Book of Mormon tells us that God has spoke the same words unto all nations, see 2 Nephi (LDS/OPV 29:8 – 9) (RLDS/RAV 12:58-63). Error has always crept in to distort truth for various reasons, and sadly this has also happened with the church that I grew up in namely the LDS / Brighamite church. 8 Wherefore murmur ye, because that ye shall receive more of my word? Know ye not that the testimony of two nations is a witness unto you that I am God, that I remember one nation like unto another? Wherefore, I SPEAK THE SAME WORDS UNTO ONE NATION LIKE UNTO ANOTHER. And when the two nations shall run together the testimony of the two nations shall run together also. 9 And I DO THIS THAT I MAP PROVE unto many that I AM THE SAME YESTERDAY, TODAY, AND FOREVER; and that I speak forth my words according to mine own pleasure. And because that I have spoken one word ye need not suppose that I cannot speak another; for my work is not yet finished; neither shall it be until the end of man, neither from that time henceforth and forever. Anthony wanted more people to learn about the Polar Configuration, as do I, which was one of my motivations for hosting the lectures. But he was also timid about it getting to big also. Look at what the reason Anthony brings up for why the LDS / Brighamite said somethign about the false prophet Julie Rowe, to quote Anthony “she has a huge following”. Some time after Anthony published his trilogy books were selling like hot cakes in Deseret Book, which are a great read about the Polar Configuration, a General Authority had a different idea about the scriptures and started looking at excommunicating Anthony for what he had published. So I understand him being timid about it getting to popular, but I honestly feel we should seek to reach God’s sheep who hear His voice instead of seeking to reach the masses. I offered to pay his expenses if he would give the lessons for free. He declined and said he liked the paywall, as it kept his critics away. (Anthony did not make much from the website, it mostly just paid for itself.) I do recommend taking his lessons if you have the money to do so. I wish the LDS / Brighamite leaders would take this statement from Joseph Smith to heart “I teach them correct principles, and they govern themselves”, instead of excommunicating members left and right if they don’t like something they said, espcially if they cannot correct what was said. Here are a few other things Joseph Smith said I find relevant. If I esteem mankind to be in error, shall I bear down on them? No. I will lift them up, and in their own way too, if I cannot persuade them my way is better. I will not seek to compel any man to believe as I do, only by force or reasoning, for truth will cut its own way. Do you believe Jesus Christ and the gospel of salvation, which he revealed? So do I. Christians should cease wrangling and contending with each other, and cultivate the principles of union and friendship. I am just as ready to die defending the rights of a Presbyterian, a Baptist, or a good man of any other denomination. I never thought it was right to call up a man and try him because he erred in doctrine, it looks too much like Methodism and not like Latter day Saintism. Methodists have creeds which a man must believe or be kicked out of their church. I want the liberty of believing as I please, it feels so good not to be tramelled. We consider that God has created man with a mind capable of instruction, and a faculty which may be enlarged in proportion to the heed and diligence given to the light communicated from heaven to the intellect; and that the nearer man approaches perfection, the clearer are his views, and the greater his enjoyments, till he has overcome the evils of his life and lost every desire for sin; and like the ancients, arrives at that point of faith where he is wrapped in the power and glory of his Maker, and is caught up to dwell with Him. 2. Not acrid, pungent, corrosive or drastic; operating gently; not acrimonious; demulcent; mollifying; lenitive; assuasive; as a mild LIQUOR; a mild cataplasm; a mild cathartic or emetic. A quote from an LDS leader stating that hot chocolate is bad, along with hot soups, showing the interpretation of hot drinks has changed through time. LDS church added a comma after used and it changes the meaning to eat meat sparingly all the time to some of the time. D&C 89:13 And it is pleasing unto me that they should not be used only in times of winter, or of cold, or famine. D&C 89:13 And it is pleasing unto me that they should not be used, only in times of winter, or of cold, or famine. Scan of 1835 D&C 80 aka Word of Wisdom. I wonder what Brother Morby would think about President George Albert Smith taking brandy every evening for medicinal purposes. He was certainly not alone among the Saints in his day. Just as Joseph Smith had, a great many Utah Mormons ended their day with a glass of beer until prohibition forced all the Mormon-owned breweries in Utah to shut down in 1920. Prohibition was the only reason Mormons stopped drinking beer, as in those days the Saints were well aware of the Lord’s approval of that traditional beverage, since he told them in verse 17 that that was what he gave them barley for. In 1843 the church’s newspaper, the Nauvoo Neighbor, advertised ale and beer available at the Nauvoo Brewery. Joseph Smith oversaw a fully stocked bar located at his home in the Mansion House. In an 1844 journal entry Joseph Smith mentions that he stopped in and “drank a glass of beer at Moesser’s”. He mentions this in passing as if it was no big deal, because to him it wasn’t. FYI Anthony was good friends with Alan Rock Waterman the author of Pure Mormonism. Soon after the thread about the Word of Wisdom happen the following converation happened, and I left the Facebook group. I will be honest I do miss the Facebook group and talking about the Polar Configuration and sharing places I see it in the scriptures, but I don’t miss how members there treat people who are not members of the LDS / Brighamite church or how they don’t like to talk about scriptures. To be honest I think the only thing in the gospel of Jesus Christ that Anthony E Larson believes in is the Polar Configuration. In this back and forth Anthony states that he believes he knows better than the prophets in the scriptures. Which I don’t believe he knows better than the prophets in the scriptures, see screen shots 1, 2, 3, 6. In fact he goes as far to say “my word is gospel for me”. With my various interactions I have had with Anthony he believes the early Catholic church leaders over what the Book of Mormon says, and he is not ignorant of that fact. If we find ourselves respecting a man or a woman’s opinions over the word of God, we should ask ourselves what does that say about our relationship we have with God? If you believe in the word of God as I do, I hope you will consider the following verses. Mosiah (LDS/OPV 26:6) (RLDS/RAV 11:111-111) For it came to pass that they did deceive many with their flattering words, who were in the church, and did cause them to commit many sins; therefore it became expedient that those who committed sin, that were in the church, should be admonished by the church. As you can see in the beginning of the conversation Mark Pinnell was part of it. I find it telling that Anthony said nothing how Mark condemned someone to hell for not believing what LDS / Brighamite church currently teaches about the Word of Wisdom, Doctrine and Covenants (LDS 89) (RLDS 86) (1835 80) (1844 81), but yet does not like it that I quote scriptures, see screen shots 7 and 8. 18 And it came to pass that they were angry with him, even because he had greater power than they, for it were not possible that they could disbelieve his words, for so great was his faith on the Lord Jesus Christ that angels did minister unto him daily. 19 And in the name of Jesus did he cast out devils and unclean spirits; and even his brother did he raise from the dead, after he had been stoned and suffered death by the people. 20 And the people saw it, and did witness of it, and were angry with him because of his power; and he did also do many more miracles, in the sight of the people, in the name of Jesus. One reason I believe we don’t see things like that now adays is because we are not striving to keep the commandments of God but are instead focused on following the false traditions of men and thus making the word of God void and are sinning, see 3 Nephi (LDS/OPV 8:1) (RLDS/RAV 4:1-2). In case you don’t believe what the Book of Mormon says on the subject the Lord reiterated the same thing in a revelation through Joseph Smith, see Doctrine and Covenants (LDS 50:28-29) (RLDS 50) (1833 53) (1835 17) (1844 17). 28 But no man is possessor of all things except he be purified and cleansed from all sin. 29 And if ye are purified and cleansed from all sin, ye shall ask whatsoever you will in the name of Jesus and it shall be done. Personally I believe it is important to “warn our neighbor” D&C (LDS 88:81) (RLDS 85) (1835 7) (1844 7). If we don’t we may have the blood of others upon us, as I talk about in McKenna Denson a force for good. Nick Galieti was my home teacher for a while. Nick did help me with getting some things done when I was not able to. But when I started to want more than the less than milk that is repeated over and over at church Nick said I had no testimony in Jesus Christ. I wonder what Nick would have told Joseph Smith if he was his home teacher? Joseph Smith did not doubt Jesus Christ, but sought to understand the gospel more with the questions he was asking, just as I was. I don’t remember the questions I had at that time, but they were not ones doubting Jesus Christ or the truth claims of the LDS / Brighamite church. I do remember some of them were about the Holy Ghost/Holy Spirit and here are some things I have learned since then, which I believe. 1 … We shall, in this lecture speak of the Godhead: we mean the Father, Son and Holy Spirit. 2 There are two personages who constitute the great, matchless, governing and supreme power over all things … They are the Father and the Son: The Father being a personage of spirit, glory and power: possessing all perfection and fulness: The Son, who was in the bosom of the Father, a personage of tabernacle, made, or fashioned like unto man, or being in the form and likeness of man, or, rather, man was formed after his likeness, and in his image; … possessing the same mind with the Father, which mind is the Holy Spirit, that bears record of the Father and the Son, and these three are one, or in other words, these three constitute the great, matchless, governing and supreme power over all things … and these three constitute the Godhead, and are one: The Father and the Son possessing the same mind, the same wisdom, glory, power and fulness: Filling all in all—the Son being filled with the fulness of the Mind, glory and power, or, in other words, the Spirit, glory and power of the Father—possessing all knowledge and glory, and the same kingdom … being filled with the fulness of the Mind of the Father, or, in other words, the Spirit of the Father: which Spirit is shed forth upon all who believe on his name and keep his commandments: and all those who keep his commandments shall grow up from grace to grace, and become heirs of the heavenly kingdom, and joint heirs with Jesus Christ; possessing the same mind, being transformed into the same image or likeness, even the express image of him who fills all in all: being filled with the fulness of his glory, and become one in him, even as the Father, Son and Holy Spirit are one. 3 From the foregoing account of the Godhead, which is given in his revelations, the Saints have a sure foundation laid for the exercise of faith unto life and salvation, through the atonement and mediation of Jesus Christ, by whose blood they have a forgiveness of sins, and also, a sure reward laid up for them in heaven, even that of partaking of the fulness of the Father and the Son, through the Spirit. As the Son partakes of the fulness of the Father through the Spirit, so the saints are, by the same Spirit, to be partakers of the same fulness, to enjoy the same glory; for as the Father and the Son are one, so in like manner the saints are to be one in them, through the love of the Father, the mediation of Jesus Christ, and the gift of the Holy Spirit; they are to be heirs of God and joint heirs with Jesus Christ. Question 3: How many personages are there in the Godhead? Two: the Father and the Son. Question 4: How do you prove that there are two personages in the Godhead? By the Scriptures. Genesis 1:26: (Also 2:6): And the Lord God said unto the Only Begotten, who was with him from the beginning, Let us make man in our image, after our likeness: — and it was done. Genesis 3:22: And the Lord God said unto the Only Begotten, Behold, the man is become as one of us: to know good and evil. John 17:5: And now, O Father, glorify thou me with thine own self with the glory which I had with thee before the world was. Question 13: Do the Father and the Son possess the same mind? They do. John 5:30: I [Christ] can of my own self do nothing: as I hear, I judge, and my judgment is just; because I seek not my own will, but the will of the Father who sent me. John 6:38: For I [Christ] came down from heaven, not to do my own will, but the will of him that sent me. John 10:30: I [Christ] and my Father are one. Question 14: What is this mind? The Holy Spirit. John 15:26: But when the Comforter is come, whom I will send unto you from the Father, even the Spirit of truth, which proceeds from the Father, he shall testify of me. [Christ] Galatians 4:6: And because you are sons, God has sent forth the Spirit of his Son into your hearts. Question 15: Do the Father, Son and Holy Spirit constitute the Godhead? They do. (5:2) Let the student commit this paragraph to memory. Question 16: Does the believer in Christ Jesus, through the gift of the Spirit, become one with the Father and the Son, as the Father and the Son are one? They do. John 17:20-21: Neither pray I for these (the apostles) alone, but for them also who shall believe on me through their word; that they all may be one; as thou, Father, art in me, and I in thee, that they also may be one in us, that the world may believe that thou hast sent me. Question 17: Does the foregoing account of the Godhead lay a sure foundation for the exercise of faith in him unto life and salvation? It does. I know that was a long quote from Lectures on Faith 5, I did try to only include what is relevant to the Holy Spirit/Holy Ghost. But it comes up a lot in that lecture. We should remember that Joseph Smith taught Lectures on Faith in the school of the prophets. Even after the LDS / Brighamite church removed Lectures on Faith from the Doctrine and Covenants without the vote of the people as was done to add it in accordance with the law of common consent, Bruce R McConkie said Lectures on Faith was scriptures and should be studied. Question 17 shows how important that Joseph Smith viewed this doctrine on the Holy Spirit/Holy Ghost is for our salvation, “Does the foregoing account of the Godhead lay a sure foundation for the exercise of faith in him unto life and salvation? It does”. There are a couple places in this quote that shows that the Holy Spirit/Holy Ghost is not a personage one being Question 3, “How many personages are there in the Godhead? Two: the Father and the Son”. The Book of Mormon refers to the Holy Ghost/Holy Spirit as God’s Holy Will just as Lectures on Faith 5 does, see Moroni (LDS/OPV 7:2) (RLDS/RAV 7:2). Moroni (LDS/OPV 7:2) (RLDS/RAV 7:2) And now I, Mormon, speak unto you, my beloved brethren; and it is by the grace of God the Father, and our Lord Jesus Christ, and his HOLY WILL, because of the gift of his calling unto me, that I am permitted to speak unto you at this time. If we believe what the Book of Mormon teaches is for our day, which I do, we should be ordaining people by power of the Holy Ghost and not by power of the priesthood. Moroni (LDS/OPV 3:4) (RLDS/RAV 3:3) And after this manner did they ordain priests and teachers, according to the gifts and callings of God unto men; and they ORDAINED them BY the POWER OF THE HOLY GHOST, which was in them. Along with all this that I just mentioned, the Book of Mormon never refers to the Holy Ghost/Holy Spirit as a personage using he or she but there are numerous examples of referring to the Holy Ghost/Holy Spirit as an idea or concept with pronoun of IT. Alma (LDS/OPV 34:38) (RLDS/RAV 16:237-238) is one example of many examples of this in the Book of Mormon. Alma (LDS/OPV 34:38) (RLDS/RAV 16:237-238) That ye contend no more against the HOLY GHOST, but that ye receive IT, and take upon you the name of Christ; that ye humble yourselves even to the dust, and worship God, in whatsoever place ye may be in, in spirit and in truth; and that ye live in thanksgiving daily, for the many mercies and blessings which he doth bestow upon you. At the risk of opening a can of worms we should look at 1 Nephi (LDS/OPV 4:10) (RLDS/RAV 1:110-111). The Spirit told Nephi execute the punishmentupon Laban for what Laban had done in breaking the law of God, I talk about this a little in Bishops are JUDGEs of Israel, but to be honest Samuel Matthews did a much better job talking about it in his podcast The Book of Mormon and the Law of Moses Episode 1 Part 1. What I want to bring out from 1 Nephi (LDS/OPV 4:10) (RLDS/RAV 1:110-111) is how Nephi did not feel all warm and fuzzy with what the Spirit was telling Nephi to do. There are times when the Lord God tells us things that are hard for us to hear and to do. At Bonneville Communications, our ability to touch the hearts and minds of audiences makes us an essential resource for organizations with vital messages. For more than 30 years, our creative professionals have designed public service and direct response messages for national nonprofit organizations such as the Huntsman Cancer Institute, Boy Scouts of America, National Hospice Foundation, The Church of Jesus Christ of Latter-day Saints and The Salvation Army. Our unique strength is the ability to touch the hearts and minds of our audiences, evoking first feeling, then thought and, finally, action. We call this uniquely powerful brand of creative “HeartSell”® – strategic emotional advertising that stimulates response. The last paragraph is the most disturbing to me. Don’t know about you but it’s sound very close to the commitment pattern I was taught on my mission. Not only that they seem to have a copyright for it and call it a “strategic emotional advertising”. Even if it was from God, which I don’t believe it is, they are selling it to other organizations. If you want to read more on HeartSell you can start with HeartSell(tm) vs The Holy Ghost on LDS Freedom Forum. Pretty much everyone believes that their feelings are confirmations from God that what they believe is true. My LDS Journey – Follow the Spirit is a good video showing “testimonies” for various restoration churches, Islam and other churches. The video and the series talks about how must if not all churches use the same techniques as the LDS / Brighamite church does to prove that they are God’s true church. Joseph Smith did not teach that the Holy Ghost/Holy Spirit was feelings, he said it was pure intelligence. This first Comforter or Holy Ghost has no other effect than pure intelligence. It is more powerful in expanding the mind, enlightening the understanding, and storing the intellect with present knowledge, of a man who is of the literal seed of Abraham, than one that is a Gentile though it may not have half as much visual effect upon his body; for as the Holy Ghost falls upon one of the literal seed of Abraham, it is calm and serene; and his whole soul and body are only exercised by the pure spirit of intelligence; while the effect of the Holy Ghost upon a Gentile, is to purge out the old blood, and make him actually of the seed of Abraham. That man that has none of the blood of Abraham (naturally) must have new creation by the Holy Ghost. Because Nick questioned my relationship with God, which Jesus in the Sermon on the Mount and Sermon at the Temple teach us not to do such things see Bishops are JUDGEs of Israel for explanation, and said my questions don’t matter, it propelled my quest to find answers in the scriptures instead of the ideas of men to be sooner than it otherwise would have been, and to quote what Arthur said to his uncle Vortigern from King Arthur: Legend of the Sword “and, for that, I bless you”. For those who love Polar Configuration imagery, King Arthur: Legend of the Sword is a great movie full of it and is a good story also, I highly recommend it. The Book of Mormon teaches that it is the Bible and the Book of Mormon that shall confound false doctrines not the sayings of modern men or women see 2 Nephi (LDS/OPV 3:12) (RLDS/RAV 2:19-23). 2 Nephi (LDS/OPV 3:12) (RLDS/RAV 2:19-23) Wherefore, the fruit of thy loins shall write; and the fruit of the loins of Judah shall write; and that which shall be written by the fruit of thy loins, and also that which shall be written by the fruit of the loins of Judah, shall grow together, unto the confounding of false doctrines and laying down of contentions, and establishing peace among the fruit of thy loins, and bringing them to the knowledge of their fathers in the latter days, and also to the knowledge of my covenants, saith the Lord. If Nick thought I did not have faith in Jesus Christ because I kept searching or because I did not understand statements from LDS / Brighamite leaders and asked for clarification, what makes him think his searching for answers is any better than mine? Why were his questions and his quest for understand is acceptable and mine was not? Perhaps he did not know that current LDS / Brighamite leaders doubt the teachings of past LDS / Brighamite even the ones that were claimed to be from God. And I predict that future LDS / Brighamite leaders will doubt what is being taught today as doctrine and what is being claimed to be from God when it is convenient to do so, as they have been doing since Brigham Young, see King Brigham to see how not sticking to what was restored through Joseph Smith was prophesied. (I wonder if some will consider my predicition based on what has happen in the past as a prophecy as Henry J Eyring considered a stadium enlargement of a growing college a prophecy, I wish I was joking but I’m not, listen to The Crying Game and learn all about it.) Also what does that say about what he thinks about other peoples faiths in Jesus Christ who are not members of LDS / Brighamite church? The scriptures teach something different about who are part of the Church of God than what Nick and LDS / Brighamite leaders teach. Lets take a look at what Mosiah (LDS/OPV 26:21-22) (RLDS/RAV 11:128-130) says on the matter. 21 And he that will HEAR MY VOICE shall be my sheep; and him shall YE RECEIVE into the church, and him will I also receive. 22 For behold, THIS IS MY CHURCH; WHOSOEVER IS BAPTIZED SHALL BE BAPTIZED UNTO REPENTANCE. And whomsoever ye receive shall BELIEVE IN MY NAME; and him will I freely forgive. Here is a quote from Joseph Smith stating that people don’t need to be Mormon to be saved, but that everyone needs to “follow the precepts of the Bible”. [Joseph Smith] closed by referring to the Mormon Bible, which he said, contained nothing inconsistent or conflicting with the Christian Bible, and he again repeated that all who would follow the precepts of the Bible, whether Mormon or not, would assuredly be saved. Interesting enough the Lord God gave a revelation recorded in the Doctrine and Covenants that reiterates the same thing. 67 Behold, this is my doctrine—whosoever REPENTETH and COMETH UNTO ME, the same IS MY CHURCH. 68 Whosoever DECLARETH MORE OR LESS than this, the same IS NOT OF ME, but is AGAINST ME; therefore he is not of my church. 69 And now, behold, whosoever is of my church, and endureth of my church to the end, him will I establish upon my rock, and the gates of hell shall not prevail against them. D&C (LDS 10:67-69) (RLDS 3) (1833 9) (1835 36) (1844 36) states clearly that it is those who repent and come unto Christ is who God considers his church. Which is in argeement the previous two quotes I gave from the Book of Mormon and from Joseph Smith. On top of that God is saying those the declare or requires more or less than this is NOT OF GOD and is against Him. The LDS / Brighamite church does require more of that for it’s membership. Every LDS / Brighamite missionary has probably read 3 Nephi (LDS/OPV 11:30-41) (RLDS/RAV 5:31-43) around a million times. I only bring this out because those verses sound very reminiscent of D&C (LDS 10:67-69) (RLDS 3) (1833 9) (1835 36) (1844 36) including about the part of “And whoso shall declare more or less than this, and establish it for my doctrine, the same cometh of evil, and is not built upon my rock” 3 Nephi (LDS/OPV 11:40) (RLDS/RAV 5:42). Misquoting God is a guest post by McKay Platt on Pure Mormonism that looks at the grammar in Doctrine and Coveants 1 (all versions) verse 30 in the LDS / Brighamite church. Misquoting God gets into the details of “Subjunctive Mood” grammar in D&C 1:30 in particular how it deals with the phrase “the only true and living church upon the face of the whole earth”. Below is a quote from Misquoting God which it gets from Wikipedia to get started. I hope it gets you interested enough to read the whole article. The subjunctive mood is a flexible grammatical instrument for expressing different gradients in thought when referring to events that are not stated as fact. It is still used frequently in such languages as French, German and Spanish, and also in languages outside the Indo-European branch such as Turkish and Hungarian. In modern English only remnants of a once complex system of separate conjugations exist. What once could be expressed succinctly with the mere change of a conjugations is now only expressible, more often than not, by using word-laden modal constructions. Around the time Nick Galieti told me I had no faith in Jesus Christ I, along with someone else who never helped, was a home teacher to the Elders Quorum President’s family. The Eleders Quorum President and his wife both told me that I was one of the best home teachers they ever had, and that they really enjoyed the lessons I made just for them, instead of just reading the Ensign articles, and how I opened up the scriptures and connected them to Jesus Christ. Their son really enjoyed how I illustrated what was going on in the scriptures, and connect some even outside of home teaching. We even went Skydiving together before he left on his LDS mission. If you want to watch my video of it here it is on YouTube. I know I don’t know everything, but something everyone needs to ask themselves is are we comparing what we believe to traditions of men that we grow up with or with the actual words of God. I want to close this post with one of Joseph Smith’s last dreams. Personally I see it as prophecy how leaders of the various churches who claim to be part of the Restoration that Joseph Smith started don’t give any credence to what Joseph Smith taught but are instead fighting over who is to be incharge of it or in other words who has authority. I was back in Kirtland, Ohio, and thought I would take a walk out by myself, and view my old farm, which I found grown up with weeds and brambles, and altogether bearing evidence of neglect and want of culture. I went into the barn, which I found without floor or doors, with the weather-boarding off, and was altogether in keeping with the farm. While I viewed the desolation around me, and was contemplating how it might be recovered from the curse upon it, there came rushing into the barn a company of furious men, who commenced to pick a quarrel with me. The leader of the party ordered me to leave the barn and farm, stating it was none of mine, and that I must give up all hope of ever possessing it. I told him the farm was given me by the Church, and although I had not had any use of it for some time back, still I had not sold it, and according to righteous principles it belonged to me or the Church. He then grew furious and began to rail upon me, and threaten me, and said it never did belong to me nor to the Church. I then told him that I did not think it worth contending about, that I had no desire to live upon it in its present state, and if he thought he had a better right I would not quarrel with him about it but leave; but my assurance that I would not trouble him at present did not seem to satisfy him, as he seemed determined to quarrel with me, and threatened me with the destruction of my body. While he was thus engaged, pouring out his bitter words upon me, a rabble rushed in and nearly filled the barn, drew out their knives, and began to quarrel among themselves for the premises, and for a moment forgot me, at which time I took the opportunity to walk out of the barn about up to my ankles in mud. When I was a little distance from the barn, I heard them screeching and screaming in a very distressed manner, as it appeared they had engaged in a general fight with their knives. While they were thus engaged, the dream or vision ended.